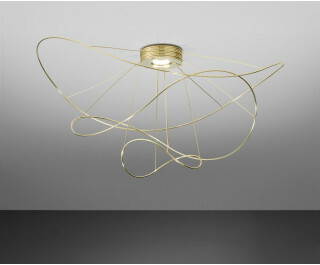 Golden ringlets flurry from the Axo Light Hoops 3 LED Pendant, surrounding a fixed point of up and down light with movement and decorative luxury. In addition to the cylindrical body holding the LED light source, the wavy structure is completely finished (including the canopy) with 24 karat gold, vividly capturing the two beams of light with a reflective and metallic luster. A central column sits within two broad hoops, creating a third tier at the bottom, allowing unobstructed up and down light to spread freely through the airy structure.